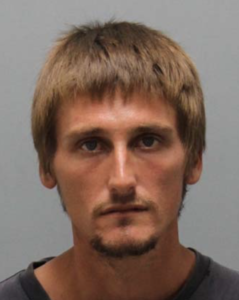 An Atascadero man allegedly broke into a Kentucky Fried Chicken restaurant in Paso Robles and stole a cash register. The suspect evaded police for several days but was then arrested after popping up again at the KFC. Shortly before 10 a.m. 0n Aug. 24, Nicholas Allen Mueller, 27, allegedly broke into the KFC at 2405 Riverside Avenue, according to the Paso Robles Police Department. Surveillance footage shows Mueller forced his way into the restaurant through a window, then removed a cash register and fled by foot. On Monday evening, KFC employees reported to police that they saw Mueller at the restaurant. Officers then arrived and arrested the suspect. Officers charged Mueller with burglary and booked him into the San Luis Obispo County Jail. He remains in custody with his bail set at $20,000. Police are asking anyone who has further information about the crime to call the police department at (805) 237-6464. He just couldn’t stay away from those processed chicken wings. KFC is finger lickin good. Food, folks and fat! Go back to the scene of the crime? I hope Nick stays out of the gene pool.